Belmopan. September 6, 2018. The Speaker of the House of Representatives, Hon. 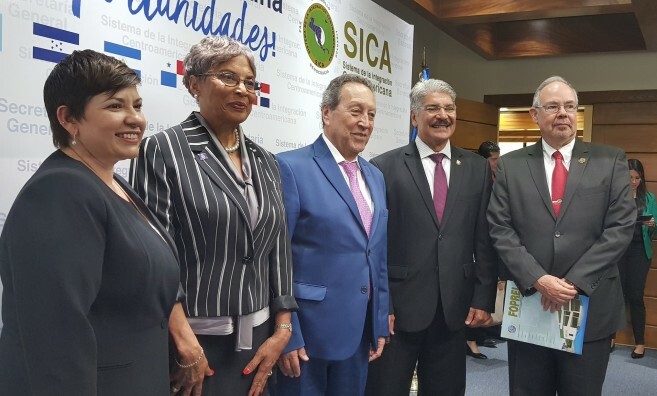 Laura Tucker Longsworth, was in El Salvador for the signing of a Memorandum of Understanding (MOU) between the Forum of Presiding Officers of Parliaments of Central America and the Caribbean Basin (FOPREL) and the Central American Integration System (SICA). The objective of the MOU is for the two regional institutions to join efforts in advancing institutional frameworks in the areas of social/economic integration and climate change among other issues. Present at the signing ceremony were the Secretary General of SICA, H.E. Vinicio Cerezo; the President of the Legislative Assembly of El Salvador, Honourable Norman Quijano, who represented the Protem President of FOPREL; and the Executive Secretary of FOPREL, Dr. Santiago Rivas Leclair. The Executive Director of SICA, Mr. Werner Vargas, and the Charge d’Affaires a.i. of the Embassy of Belize in El Salvador, Ms. Margaret Juan, were also present at the signing ceremony. After the signing ceremony, the delegation of FOPREL discussed with the Secretary General of SICA ways on how the two regional institutions can work together on harmonizing a regional agenda in the areas of nutrition and food security. Belize currently holds the Protem Presidency of SICA, while the Congress of Honduras holds the Protem Presidency of FOPREL.